If you are interested in booking, please tell me about yourself, and your other guests plus your reason for visiting the HMB area. Ideal for one or two couples. Minimum Age for Renters is 12 Years Old. No Pets. No Smoking. You will be looking over beautiful gardens with year round color as you gaze at the Pacific Ocean. Views of white water, whales, fishing boats, cruise ships and sunsets with the mystical Green Flash. White sand Montara Beach, La Costennara Restaurant and Montara Mountain trail heads are several blocks from the Enchanted Ocean View Bluff House. Amazing views where the mountain comes down to the ocean. This expansive stunning ranch home has two bedrooms each located at different ends of the home for ultimate privacy. Two gas fireplaces for romantic evenings are located in the family room and the 420 sf. Living Room. Two enclosed enchanting garden areas offer peaceful spaces as well as a large view deck to watch the expansive ocean and sunsets. The gourmet kitchen features a subzero refrigerator, dishwasher, trash compactor, two ovens and counter space for multiple cooks. Master bath has Toto bidet with heated seat. Allergies? No pets have been in the house and the furnace has a HEPA Filter. Hi-speed secure wi-fi connection too! Peaceful and serene, located on top of the bluff at the end of a cul-de-sac just 25 minutes from the SF Airport and The City. 10 minutes away is the charming town of Half Moon Bay. 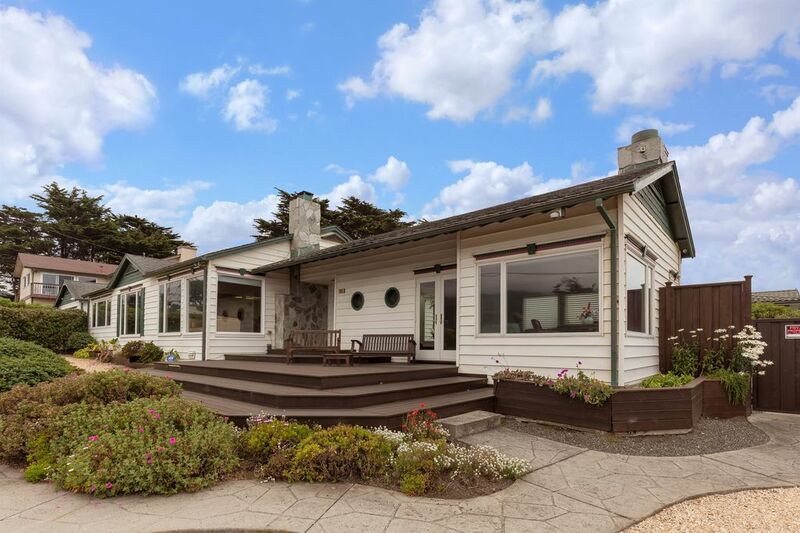 Montara Beach is one block away and Montara Mountain hiking can be started from the house. The coastal area is perfect for those that love to walk, hike, bike, relax and enjoy each other. A rejuvenating experience for the body and spirit. OCCUPANCY-In consideration of our neighbors and because of liability issues, OCCUPANCY AND USE OF THE HOUSE IS STRICTLY LIMITED TO THE NUMBER OF GUESTS WE HAVE AGREED TO IN YOUR RESERVATION. Other persons are not allowed on the property and there can be no loud parties at any time. Our neighbors closely monitor the neighborhood and record and report disruptive events as soon as they happen. IF WE RECEIVE A COMPLAINT REGARDING EXCESSIVE TRAFFIC, NOISE OR PARTIES OF ANY KIND YOU WILL FORFEIT YOUR SECURITY DEPOSIT. We understand that many wish to have events and parties and in fact love a good time ourselves. If that is your need then our home is not the place for you. Security cameras at outside front entry. Michael and Kathy Rain are local Realtors on the Coast for over 20 years. Michael also has a degree in music from Cornish School of Music and plays guitar, drums and vocals. Passionate about the ocean, they also have an oceanfront condo and vacation rental in North Kaanapali Beach in Maui, Hawaii. Avid hikers, both Coasts are ideal locations. This beautiful location with views of the mountain coming down to the ocean never ceases to delight our senses. Love to hike Montara Mountain with it's many trails, walk the Coastal Bluff Trail in Half Moon Bay and the Pacifica Coastal Trail at Linda Mar. The Harbor area is a treat with kayak rental, boat excursions, restaurants and fresh fish off the boats. Being just 25 minutes from San Francisco makes for great day excursions. We are within a few hours of several wine regions. Our sleepy little town is amazing and affords a serene respite for the spirit. Montara Mountain View where there are a dozen hikes. Gas furnace with HEPA Air Filter. No pets have been in the house for over 25 years. Recently installed high speed internet router and modem. Dine in an amazing setting with ocean views. (3) HD TV's in Family Room and both bedrooms. I-pod player/radio. We really enjoyed our stay. The views were stunning, and the home was impeccably decorated. The furniture was comfy and it felt like home. We arrived in the dark and we're thrilled when we woke to the spectacular view. Our first call that morning was to extend our stay by two days. The house was lovely, welcoming and an easy 30 minutes to San Francisco. Will stay again the next time we are in the area. Beach home is beautiful with great interior design colors and finishes. Views of the ocean are gorgeous. Enjoyed our stay and would definitely book again. This was a most wonderful location for our family to have a getaway over New Year's. The house easily accomodated my parents and our two kids. It was an easy drive from Half Moon Bay, and in walking distance of Montara State Beach. We spent a lovely New Year's cooking and spending time together and enjoying the breathtaking views from the many windows. The house was clean and beautifully decorated. Thank you very much for a peaceful retreat! You cannot go wrong staying at this perfectly arranged home. It doesn’t take you long to feel like you’re right at home. The waves have a calming influence. You’ll find yourself either standing on the deck or looking out the window, the ocean is beautiful. Early mornings, and sunsets are to die for. And the ride to and from the house is just as breathtaking...but keep your eyes on the road! It’s amazing what a worry free home situated in the perfect location will do to relax you. We will be back in the summer! You wlll arrive at a destination resort area on the Half Moon Bay Coast. Beautiful beach boardwalk, pier and harbor, restaurants, fresh fish to bring back, whale watching and deep sea fishing excursions. 25 minutes to San Francisco. Hiking trails are literally outside the front door. Kayaking is in the Harbor just 3 miles away where you can also paddel board and wind surf. Montara Beach is a long white sand beach with good surfing. Mavericks surf is 3 miles away. Bicycle trails are everywhere including Montara Mountain with many off path trails for biking and horseback riding. Stables are within a few miles, and yes, you can ride your horse down to the beach in Half Moon Bay.